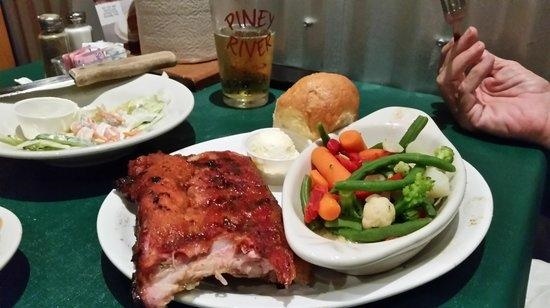 If you are looking for a great restaurant in Branson that offers affordable meal, some entertainment, and refreshing home brewed beer, Charlie’s Steak, Rib and Ale is the perfect place for you. Charlie’s Restaurant has been serving authentic American food since 1999 in Branson. Charlie’s Steak, Rib and Ale Restaurant provides you and your family good food and cold drinks in a relaxed atmosphere. This restaurant started its in-house microbrewery in 2002 that turned into a popular addition to their spacious steak house. Their sizzling steaks, barbecue, seafood and chicken that are freshly prepared with family ingredients and seasonings are the things not to be missed in this restaurant. Beautifully located on the Strip, Charlie’s provides ample parking in the private lot and is pretty easy to spot as there is a gigantic sign on the road. Dining at family-owned Steak House & Microbrewery allows you to enjoy not only delicious steaks and great beer but also live entertainment as well. This steak house and microbrewery is sure to give you a unique dining experience because of its beautiful ambiance in a rustic atmosphere that can make your meal more enjoyable. All round the place, you will notice that it is beautifully decorated with all sorts of antiques and oddities, including a taxidermy raccoon holding a box of cracker jacks and a huge plastic cow named Gaylord. Charlie’s Steak, Ribs & Ale offers the best steak in town. You simply can’t go wrong when you dine here as you can have great options from sirloin, rib eye, porterhouse, New York strip hand-cut steaks, or one of their in-house hickory smoked meats like pulled pork, ribs or sirloin. This beautiful dining place in Branson also serves delicious BBQ, burgers, soups, salads, and a wide selection of sandwiches. While you’re enjoying your wonderful lunch or dinner, don’t forget to have some of Charlie’s cold beers from their own micro-brewery. All the meats in this restaurant are selected properly, cut, and aged up to 21 days to make your dining experience a memorable one. The beautiful setting of the restaurant features a Western look with lots of wood and brick, fishing poles, sporting goods, and a wide display of antiques. Charlie’s food is pretty delicious when consumed with beer. The BBQ served at Charlie’s is above average especially by local standards. With a little craft beer culture in Branson, your dining experience in the evening at Charlie’s with some cold beers is something to remember. At Charlie’s you can bring home a memorable dining experience once you hear a nice performance of a lady entertainer who sings pretty good country songs of Patsy Cline, Loretta Lynn, Jeannie C. Riley and more – a very Branson experience indeed. Charlie’s offers Daily Specials for every lunch and dinner menus. But in any day, Charlie’s Steaks, Ribs and Ale Restaurant is always ready to serve you their best that include sizzling steaks, barbecue, seafood and chicken that are freshly prepared with family ingredients and seasonings.